Every day street clothes - wear your choice of T-shirt, pants/shorts and of course sneakers, this is more like what you would wear in real life, so lets train in our street clothes. DO I HAVE TO BE FIT TO DO CLASSES? No. The classes do involve physical activity and moving around, however you do not need to be fit, you will have to defend yourself as you are now so no you don’t have to be fit. Training is also great basic fitness. However you can work at your own pace. HOW LONG WILL IT TAKE FOR ME TO REALLY BE GOOD? Because everyone has different skills and learns at different speeds. 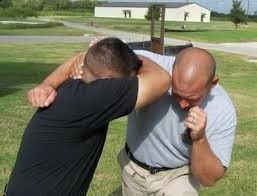 It is not possible to say exactly how long it will take it to be really good it at self defence and street survival. But what can be safely said is that it will take just six months for you to be able to deal with the most common threats this is because Streetsmarts Self Defence Tactics is all about teaching you realistic and effective techniques as quickly as possible. If you want the best possible chance of survival against real world threats you need look no further than Streetsmarts Self Defence Tactics.